Drone photography is more popular than ever. There’s two reasons for this. The first is that drones are more widely accessible than they’ve been at any point in history – anyone can find a cheap drone and start learning how to fly and take photos. And the second is that the technology has advanced to the point that drone shots can now compete directly with helicopter photography – and in many cases, even surpass it. To celebrate the achievements of these budding drone photographers, the 2018 Drone Awards, organized by a non-profit organization called Art World Travel, have chosen what they consider the seven best drone photos of the year. More than 4,400 submissions were sent in by amateur and professional photographers alike from 101 countries, so the competition was stiff. The winners were chosen by a trio of judges looking at composition, use of color, and many other factors. 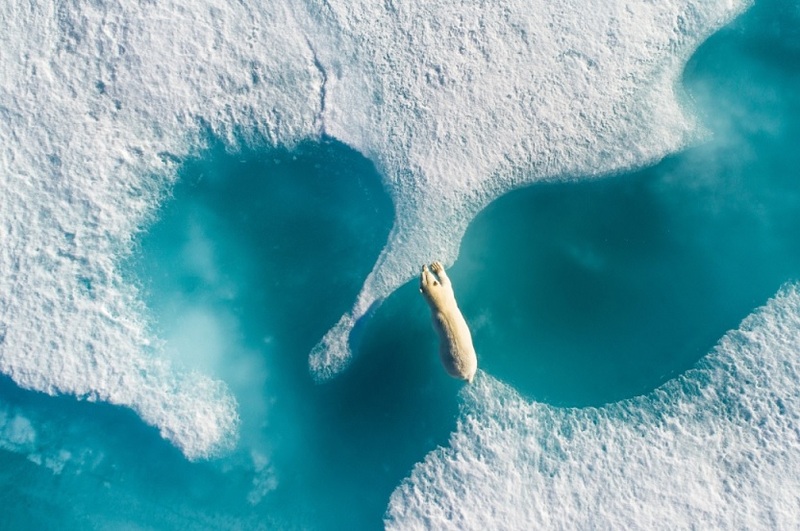 The 2018 grand prize winner, pictured above, is simply titled Above The Polar Bear and was taken by Florian Ledoux using a DJI Phantom 4 Pro. Above The Polar Bear was taken in Nunavut, Canada while Ledoux was working on a wildlife report in the area and shows a polar bear crossing from one piece of ice to another. The colors here are incredible – the bear’s fur appears almost golden in the light of the Northern sun and it contrasts beautifully with the nearly-frozen pale blue water. Another one of our favorites is the winner in the “Best Abstract Photo” category – Weather Snake by Romanian photographer Ovi D. Pop. 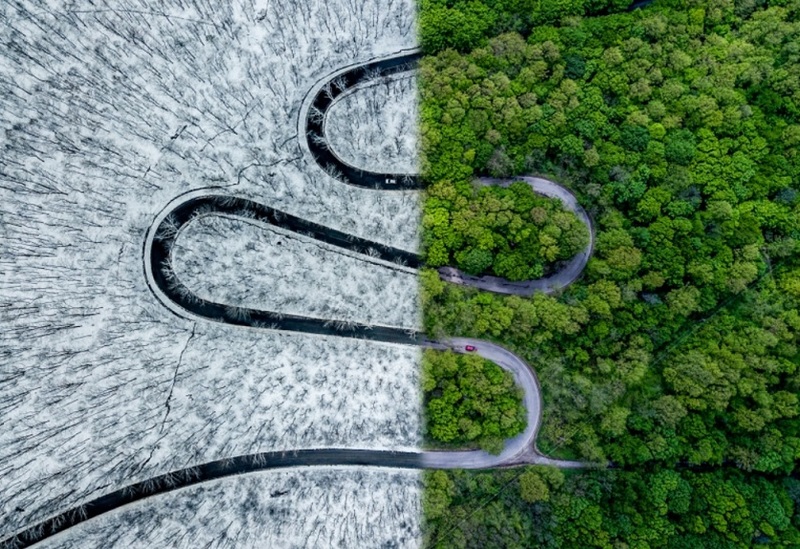 This striking image is made of two different photos carefully composited together and depicts a road that winds through different elevations in a forest near Pop’s home of Derna, Bihor County, Romania. One of my favorite details in this photo is the way that the snow-covered tree branches dangling over the road on the left side of the photo look like snowflakes, or perhaps cracked ice. It’s a neat perspective trick, as is the way that the trees on both sides all appear to be angled so that they point towards the center of the image. We couldn’t find the exact drone used for this photo, but it’s presumably something with a fisheye lens – possibly a DJI Mavic Pro or a Parrot Bebop 2. The third winner we’d like to highlight in this article is Skating Shadows, the Sports category winner which was taken by Dutch sports photographer Vincent Riemersma. 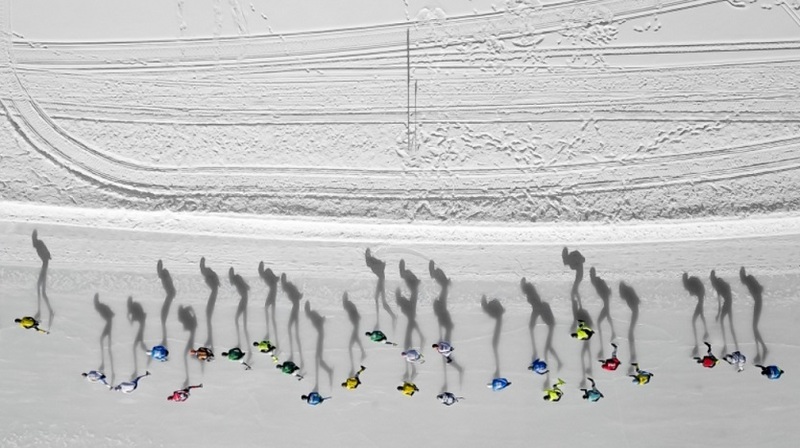 The image captures a group of twenty-six skaters from above as they race over the ice. The top half of the photo is a bit dull, although the line between the track and the extra ice cuts a nice line through the center of the photo, but the shadows themselves are hypnotizing. They look a bit like Hebrew letters, or perhaps exaggerated cartoons of long-legged men and women, half-bent like something not of this Earth. And with the way that the shadows appear to be standing upright even though the photo is a bird’s eye view shot, this a truly mind-boggling photo that only gets better the longer you look at it. You can see all seven winners as well as the runners up in each category by clicking here. And let us know in the comments: do you think these seven photographs deserved to win? Or are some of the runners up more deserving of the 2018 Drone Photography Awards?